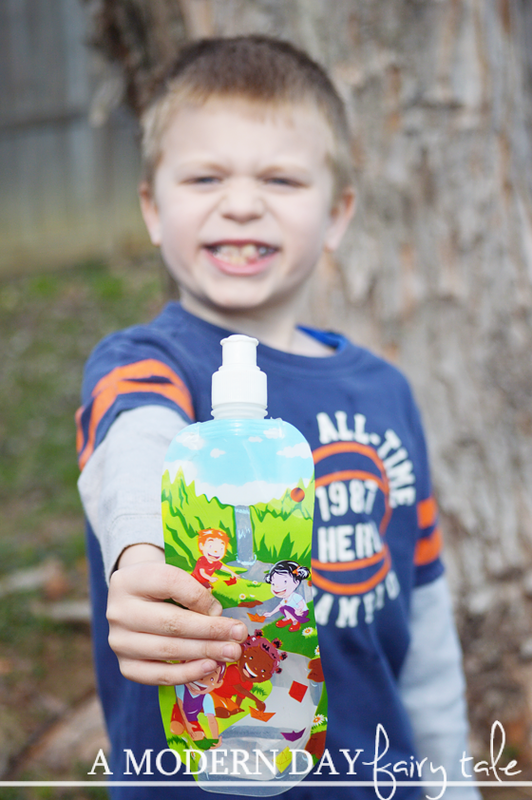 **A huge thanks to Fresh Baby for sponsoring today's post. All thoughts are my own. I'll be completely honest, drinking enough water has been something that I personally have always struggled with. Of course we all know the reasons why we should drink water-, but sometimes bringing ourselves to do so can be kinda like pulling teeth. As a mom, this is something I'm really striving to improve on- both for myself and for my children. I want to show them good drinking habits from the beginning so that they won't fall into that pattern of choosing sugary drinks over water. Beverage companies spend four times as much—$866 million—to advertise unhealthy drinks as they did to advertise 100 percent fruit juice or water. A typical children’s drink contains 16 grams of sugar, more than recommended for an entire day. Some children’s drinks may feature reduced sugar but many (36%) contain artificial sweeteners. Sugary drink and energy drink brands are extensively using Facebook, Twitter, and YouTube to reach youth. Flavor Up. For some, water is hard to drink because there just isn't any real flavor. If this is you, consider adding a little bit of natural flavor. Add in some fresh squeezed lemon or another citrus-y fruit. Just a little bit will make drinking water a little more bearable! Put It In A Fun Cup. This one may be more for the kids, but I'll admit, I enjoy using fun cups myself! 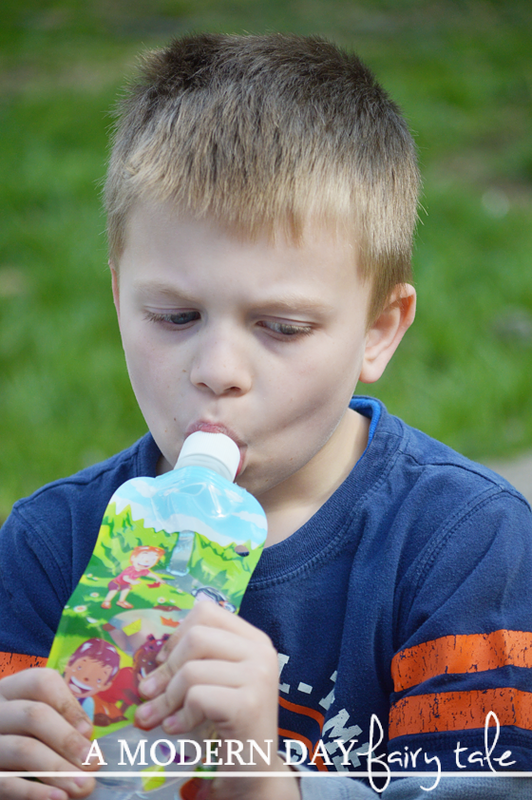 Let's be honest, water- whether a bottle of water or straight from the tap- just doesn't grab kid's attention the way a brightly colored juice box...so make it more fun with a great cup! Use a silly straw. Go with your child's favorite characters. Get a collapsible water bottle. (These collapsible water bottles from Fresh Baby happen to be a favorite in my house.) 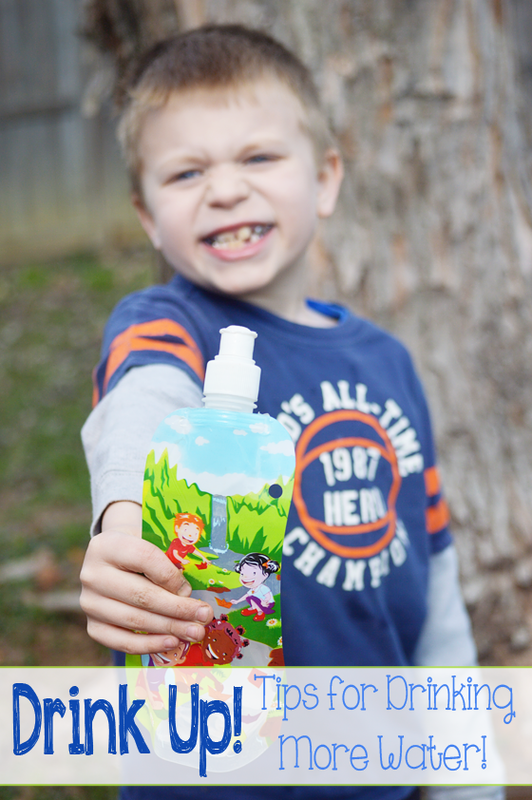 When you make drinking water more fun, kids don't feel like they are missing out on anything! Carbonate It. Are you a recovering soda addict trying to make yourself drink more water? Consider carbonated water, so you still get that same bubbly feeling with each sip. Keep in mind that not all carbonated waters are created equal, so be sure to check labels for any added sweeteners or sodium. Limit the Options. I'll be honest, if I'm given the choice between something with a little more flavor and water, it'd be very hard to choose the water. The same goes for kids. So, to make it easier, we just make sure to limit the options we have on hand. When they don't have these other options to choose from, they get in the habit of drinking water and will continue to do so even when given those other options. One way that Fresh Baby is partnering with Drink Up is through their fabulous MyPlates! 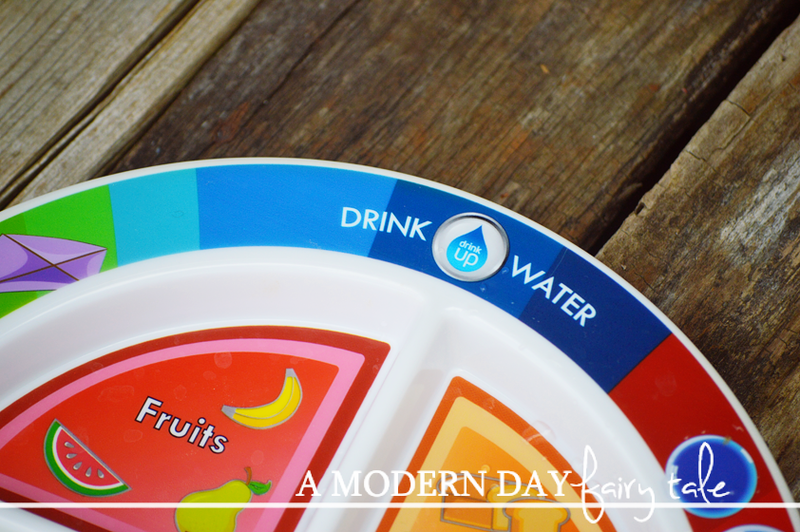 Not only do these plates feature this little reminder to drink our water, but a portion of the profit of their MyPlate Dinnerware 3-pack is donated to the Partnership For Healthier America's Drink Up Initiative that encourages everyone to drink more water! To further help encourage little ones to drink water over other sugary drinks, Fresh Baby is having a special 'Drink More Water' giveaway! 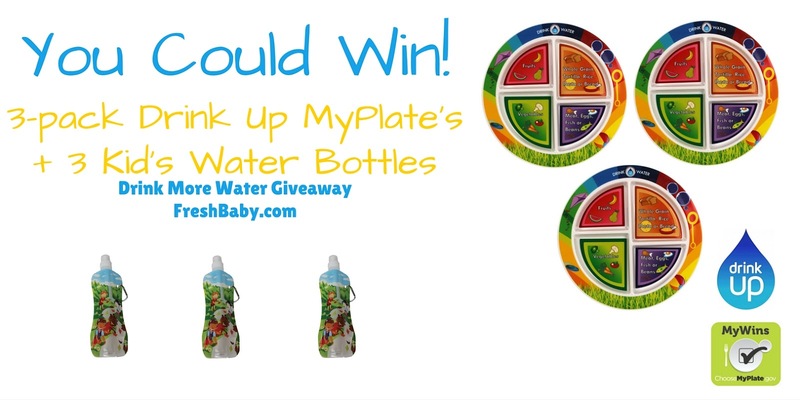 They are giving THREE lucky winners the chance to win a 3-pack of Fresh Baby’s Drink Up MyPlate’s and 3 Kid’s Water Bottles. (Retail Value $34.80). Visit here to enter. Are you a water drinker? What tips and tricks have you found to encourage yourself and your children to DRINK UP? My son adores fresh fruit in his water!! And always ice cold!! I don't drink soda, do drink lots of water. Thanks for sharing with your readers these great tips! I really need to be reminded to drink more water! I drink water, but I have to have a little flavor in it! I buy natural flavorings to squirt in it. It's cheaper than buying soda, for sure, because I just use tap water.